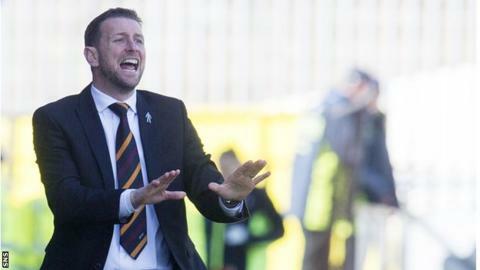 Motherwell manager Ian Baraclough believes his side have to beat Ross County on Saturday to have a chance of avoiding a relegation play-off. The Steelmen are currently 11th in the Scottish Premiership and six points behind County with four games left. Baraclough admitted it would be "very difficult" to catch the Staggies or ninth-placed Kilmarnock if they lose. "There is pressure at any stage of the season wherever you are in the league," said the former Scunthorpe boss. "You would all like to be at the top end but there are pressures there as well. "If you are going to be a professional player you have to learn to deal with these situations, otherwise it will be a short career." Kilmarnock are a point better off than County and also have four games still to play. Jim McIntyre brings his County team from Dingwall to Fir Park keen to clinch the three points after losing to Partick Thistle last weekend. That brought an end to an undefeated run that stretched back to 7 February. Similarly, Baraclough is desperate to get his team back on track after successive away defeats by Partick Thistle and Lanarkshire rivals Hamilton. To do so, he believes "passion, endeavour, a team ethos" and being "very, very confident in your own ability and your team-mates' abilities" will be required. "If you can guarantee those bullet points you will win most games," he said. Motherwell have scored nine goals without reply in their last two home games, and three of their last four games are at Fir Park so there remains hope that they can avoid entering a two-legged play-off with Hibernian, Rangers or Queen of the South. Baraclough, while acknowledging that he and the players are "working for our futures", is looking for his players to take the game to County. "We have opposition who have done very well and are not going to roll over," he said. "We have to be ready for what they throw at us and be ready to counter that with our own style of play." Read more on Did your team make Scottish football's play-offs?